"Off the Record" by Robin Caroll is book three in the Faithgirlz -- Samantha Sanderson series. Sam is a middle school student and investigative journalist. 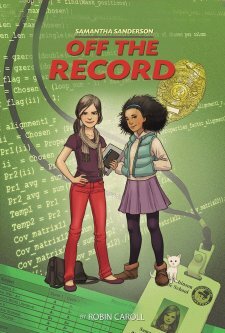 In each book, Sam reports the facts, never reveals her sources and ultimately, with the help of her bff Makayla, solves the crime. In "Off the Record", the report cards at Robinson Middle School have been tampered with. Students are finding that their marks are significantly lower than deserved. The principal willingly acknowledges the problem, but has no idea what could have caused it or how to remedy it. Sam's new friend, Felicia, is considered the prime suspect because of her past. Sam must uncover the truth and, hopefully, clear her friend's name in the process. Throughout the book, Sam is focused on the resolution of "loving her neighbour". She finds this easy with her literal next door neighbour -- a sweet lady who is always there for her when she needs her. Sam finds "loving her neighbour" much harder when it comes to showing kindness towards Aubrey, the meanest girl at school. Throughout the book Aubrey is referred to as "she-beast" and another student is referred to as a "brat". I guess Sam is finding that loving others is going to take some time, but I wish there were less name calling and less negative talk about others in the book. I love books for pre-teens, but the writing style of this book is one I find tedious. There are metaphors and descriptions that are so weird that they jolted me back to reality and wrecked the flow of the book for me. An example is: "The rest of the day dragged on, as if someone had shoved peanut butter in all the school's clocks. "(pg 14). That was (sort of?!?!) how I felt reading this book. Maybe your pre-teen won't notice the issues with the flow of writing and will manage to enjoy the book. I won't be recommending it to my pre-teen though.